In this millennial age, children even at the early age of 3 have their own tablets. 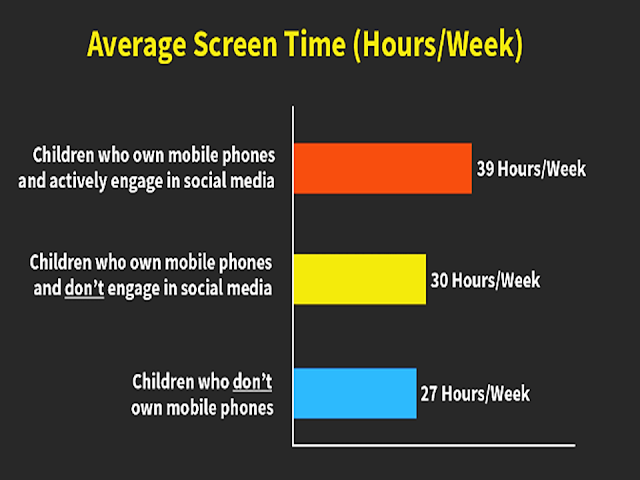 Their attention is drawn with these gadgets, spending a lot of time with these lacking of physical activities. Children are also fond of online games. They hardly play outside with other children or read books. Do you know that being online using a computer, tablets or phone has adverse effects on their emotional and physical health? On top of these, children who are spending most of their times online are most prone to cyberbullying, or even sexual harassment. 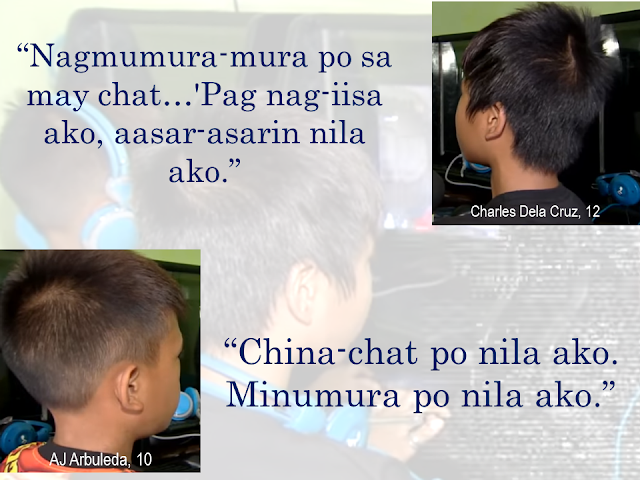 Children who play online games are exposed to cyberbullying at an early age affecting their overall well being in the future. It is either they would have a very low self-esteem or they would become a bully. 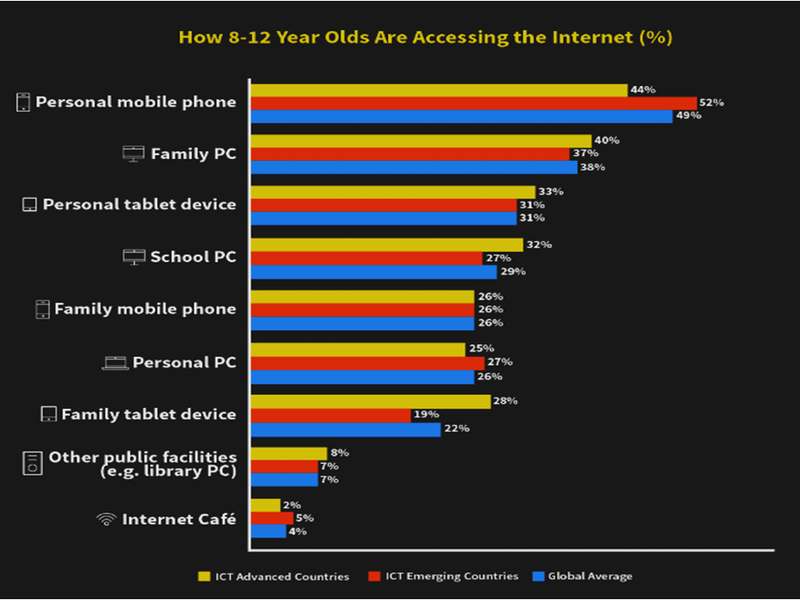 In the Philippines, about 73% or 7 out of 10 with ages 8-10 years old are exposed to cyber risk, according to the studies by DQ Institute, together with the Department of Education (DepEd) and Globe Telecom. 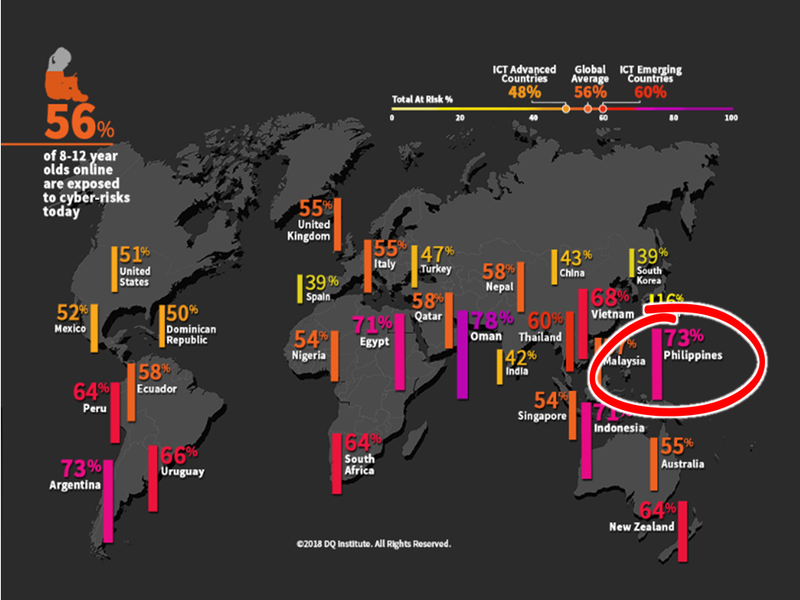 Marginally higher than the global average. It also shows that 67% of Filipino children uses social media sites higher than the global average of only 39%. They also spend 34 hours every week with their gadgets, also higher than the global average of only 32 hours. DQ studies also warned that aside from cyberbullying, other risks for the Filipino youth includes video game addiction, meeting strangers they only knew online, and sexual harassment. 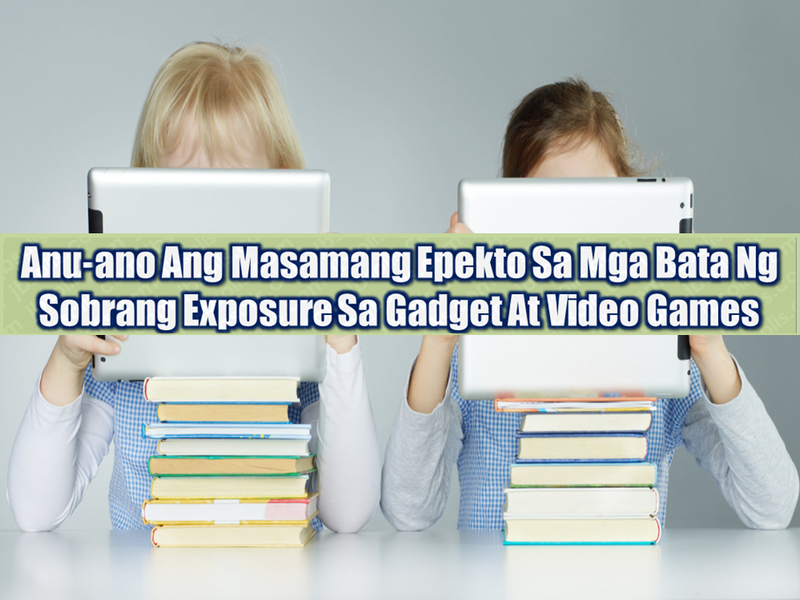 Lito Averia urges parents and schools to devote time to educate the children how to use properly use the internet and the information they can get from it while avoiding the risks and protect themselves from being abused. 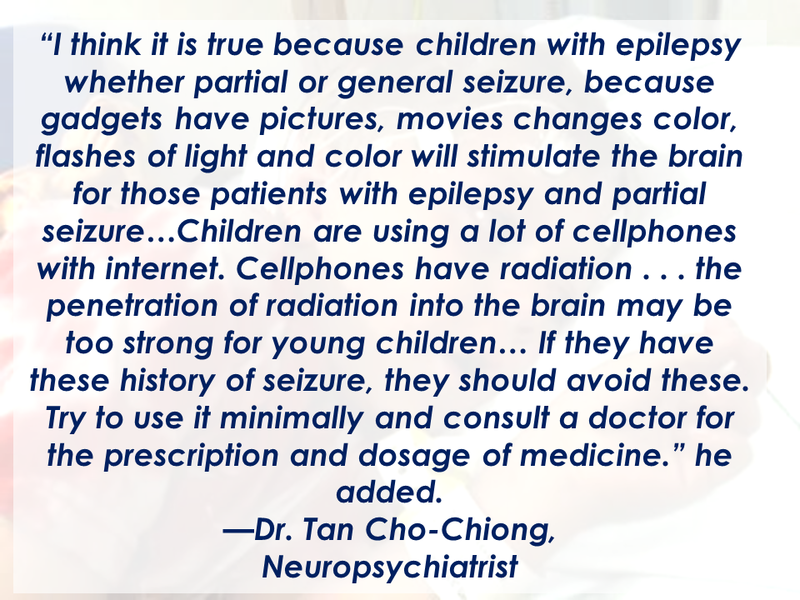 According to Dr. Tan Cho-Chiong , a neuro- psychiatrist, prolonged use of gadgets and exposure to television and computers can contribute much to a child developing seizure. 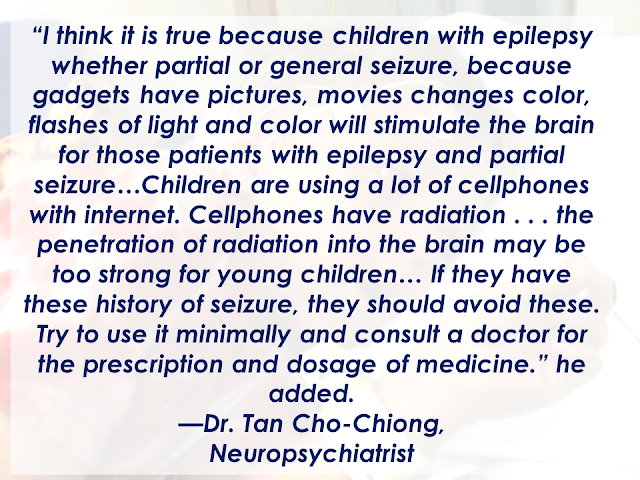 Dr. Tan explained that seizure has various causes that is why it is important for parents to seek the help of a neurologist or a neuro pedia once a child lost consciousness, have uncontrollable body movements and symptoms of epilepsy. It is also important that parents and guardians should be always open to their kids. 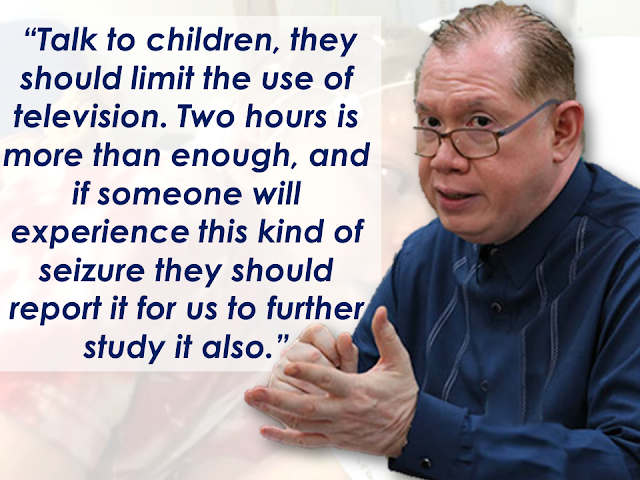 Dr. Eric Tayag also said that DOH is already looking into this matter although focal seizures associated with gadget use among children is yet to have a clear and concrete evidence. Facebook posts of Icon Molvizar Collamar, received 70,000 comments and more than 200,000 shares after it went viral on Monday. 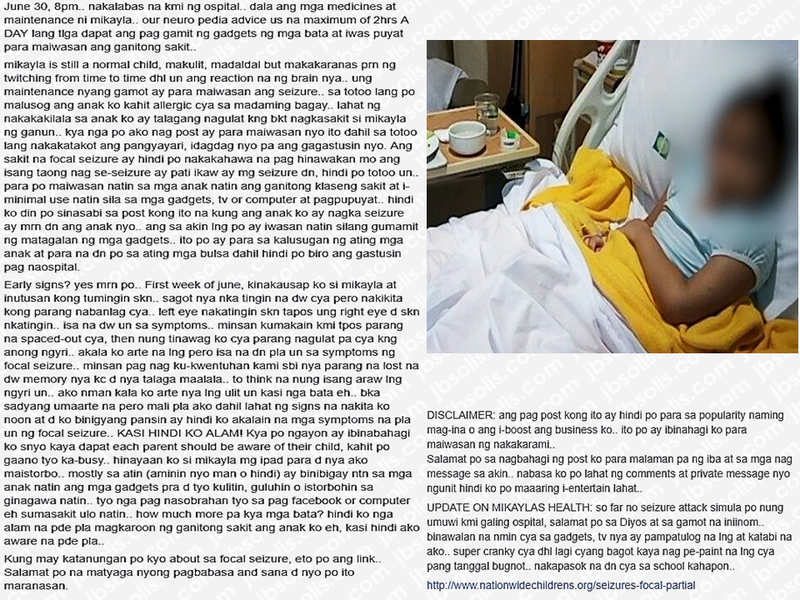 Icon shared what happened to her grade 2 daughter, Mikayla, after prolonged use of gadgets. Most of the time she lets her daughter play with her gadget or just watch TV. On June 27, she saw her daughter lying on the floor having a seizure. The child couldn’t move her arm. Her lips were dry and she couldn’t speak. Maricon immediately sought a doctor’s help. After conducting medical tests, the neuro-pedia said Mikayla suffered from a focal seizure. Such condition is oftentimes caused by prolonged use of gadgets, watching TV and overexposure to computers. 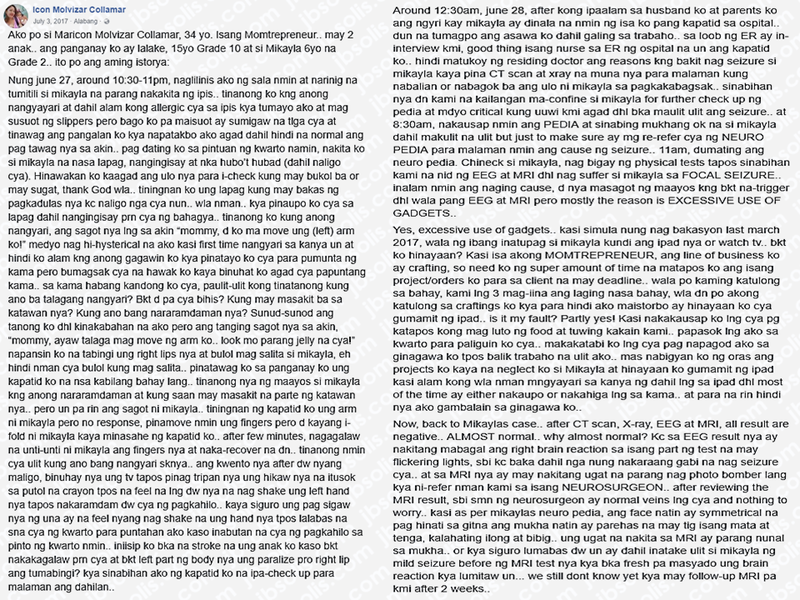 After what happened, Maricon decided to raise awareness among her fellow parents through social media.